What Does Satan Really Want? Latest from Rabbi Mendel Kessin. The Trump victory, yarzheit of Rachel Imeinu, the Mabul, the significance of 9 November...... and he's only just getting started. Rabbi Kessin's most recent shiur, which I have not yet listened to. ''Everybody knows that Evil Inclination, or Yetzer HaRah, or Satan, or Malach Hamaves, is an angel assigned to do the job. We've also heard about Good Inclination, or Yetzer Tov. However, the nature of Yetzer Tov is obscure. Somehow nobody heard about an angel representing Good Inclination. What is it, really? What kind of a creature, what kind of a being is hiding behind the term? The nature of Good Inclination is revealed by R' Mendel Kessin. The series on Ramchal's Derech Hashem continues. Rabbeinu Bechaye explained why the text mentions two names for the same place [Kiryat-Arba and Hebron]. Kiryat-Arba is called Hebron because the soul of anyone buried there unites [mithaberet] on high in the city of G-d with the four [arba] camps of the Shechinah. 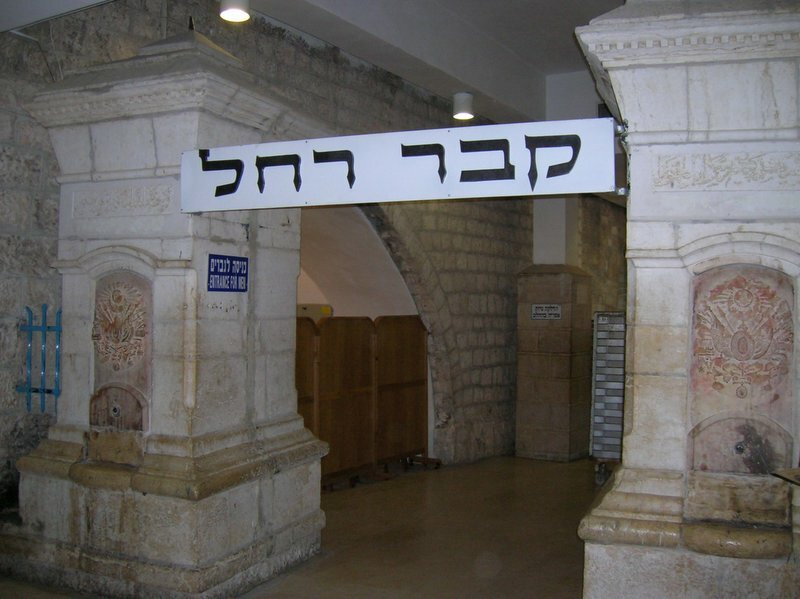 This is why the Patriarchs sought to be buried in this place, namely that from there, souls merit to be reunited [leit’haber] with their source, which is the Throne of Glory. Avraham sent Eliezer to fetch Rivkah at the earliest opportunity, as soon as she had reached marriageable age. 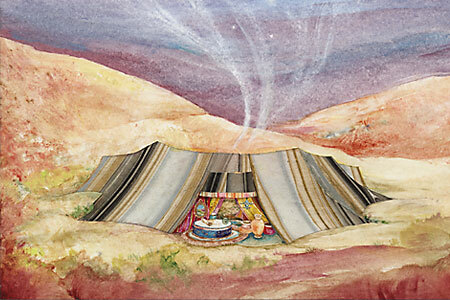 Eliezer's miracle - where his journey was miraculously shortened, allowing him to complete a 17 day journey in one day - thus spared Rivkah from spending an additional 17 days in an atmosphere of idol worship. From this we can be assured of the speed with which G-d will send Moshiach, saving the Jewish people from even an additional moment in Exile. Here is some light relief, in the form of Jackie Mason, who returned to the internet to record this 90 second video on Donald Trump. Shortly before his marriage, Yitzchak had reached a remarkable degree of spiritual perfection. Right at the beginning of his life he was the first Jew to be circumcised at eight days. He was then educated by Avraham our father, and later showed an eagerness to sacrifice his life to G-d, at the Akeida, from which point on he attained the sanctity of a burnt offering [an olah temimah]. Rivkah, on the other hand, was ''a rose amongst the thorns'', born into a wicked, idol-worshipping family. The union of Yitzchak and Rivkah was thus a meeting of extremes, and for this very reason it is recorded in the Torah, since Torah itself is a guide to uniting extremes. For when any mitzvah is observed, a mundane physical object becomes infused with Godliness and holiness. Thus, the marriage of Yitzchak and Rivkah represents the marriage of the spiritual and the physical. And this explains why the Parsha spends so much time discussing their story, since it was the basis of everything that was to follow. What is the meaning, asked the Dubno Maggid, of the expression "alien and resident"? An alien is a person who resides in a land temporarily, while a resident's status is a permanent one. An alien, therefore, is not a resident, nor is a resident an alien. Each individual is required to prepare himself for his eternal residence in the World to Come by performing mitzvos and good deeds in this world, his temporary dwelling. Thus Avraham Avinu was saying "I am both an alien and a resident; I am an alien temporarily living in the world before I will become a permanent resident of the World to Come." 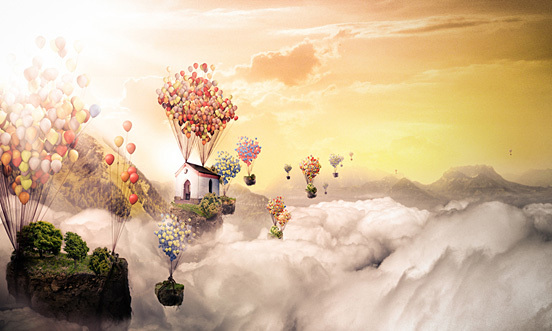 The Chofetz Chaim illustrated this idea by way of the following parable: There was a very wealthy man who wished to build himself a luxurious house. He contracted an architect who began to draw blueprints for the future home. "It is very important to me" said the wealthy man to the architect, "that the living room be spacious and comfortable. 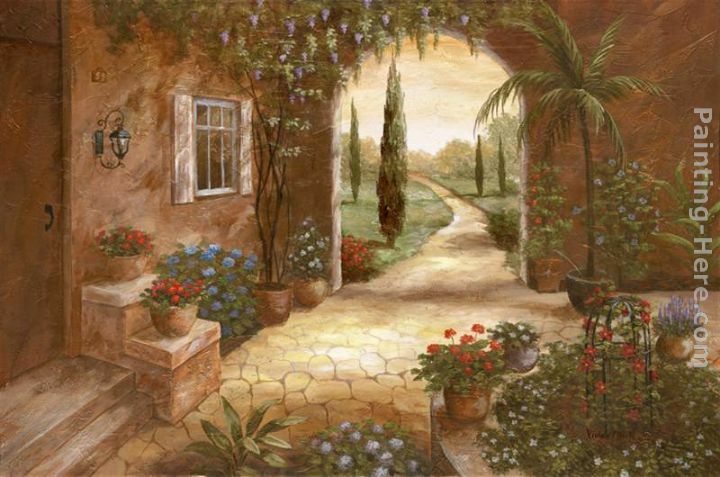 Yet it is also important that the hallway leading to the living room be very large as well." The architect took the necessary measurements and began to tell the man what he thought. "There is most certainly not going to be enough space for both the living room and the hallway to be large and roomy. You are going to have to make a decision - do you want a spacious living room or a spacious hallway?" "I'll give you a bit of advice." continued the architect. "Being that the prevailing custom is to make the living room as large as possible and not to invest very much in the hallway, I'd suggest that you do the same. It would be ridiculous to do the opposite and make the hallway larger than the living room. After all, you don't want people to laugh at you." So it is with us, said the Chofetz Chaim. Our duty in this world is to prepare ourselves for the eternal life, so that our portion in the World to Come will be as great as possible. How are we supposed to do this? By living our lives according to the Torah and by performing the mitzvos. How foolish is the man whose sole concern is to ensure himself a comfortable life in this world. He is comparable to the wealthy man who requests a large hallway but a small living room. When he arrives in the World to Come everyone will laugh at him! ...actually I would say that's how the light gets out.... because every single thing in this world contains a Divine spark, and when we utilize that object in a good way, as part of a mitzvah, we redeem the sparks. This is called birurim. Sitting in his hotel room in New York, Rabbi Sacks suddenly had a thought about a connection between the late Leonard Cohen's final song "You Want It Darker", the current state of the world and the week's parsha of Vayera. Leonard Cohen was given a Halachic Jewish burial in a quiet ceremony before the media was notified of the poet and musician's passing. Leonard [Eliezer Ben Nissan HaKohen] was born in Montreal on the 12th of Tishrei, 5695 [September 12, 1934]. His great-uncle, Rabbi Zvi Hirsch Cohen, a pious graduate of the Volozhin Yeshiva, had been the chief rabbi of Montreal and Canada. Born in Westmount, both his grandparents were prominent Orthodox Jews. His mother's father was Rabbi Shlomo Kolnitsky-Kline, a graduate of the Kovno Yeshiva. He was called the Sar HaDikduki (master of grammarians), and he wrote important Sefarim, including a thesaurus on Talmudic interpretation. 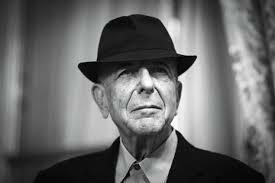 His father's father was Lyon Cohen, one of the founders of the Shaar Hashomayim Shul, of which Leonard was a member. In an interview with Jeff Burger, he told the biographer that he often reads Tehillim to find inspiration for his music and poetry. "When they lift up the Torah and say ‘Etz chayim hi l’mah chazikim bah,’ that kind of thing sent a chill down my back," he said. "I wanted to be that one who lifted up the Torah." He also recalled his pride at being a Kohen. "I wanted to wear white clothes, go into the Holy of Holies, and negotiate with the deepest resources of my soul," he told Burger. "That was poetry to me." 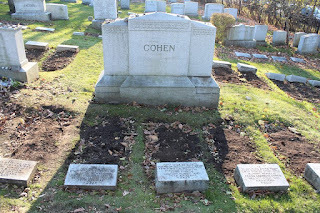 As Cohen's fame grew, he took public stands for Jewish causes and openly displayed his Judaism with pride, singing in Yiddish and going on a tour in Israel where he performed the Birkas Kohanim. During the Yom Kippur war in 1973, he flew to Israel to perform and raise the morale of Jewish soldiers. Cohen's father had fought in World War I, and he rushed to Israel, because as he later told the media, "I am committed to the survival of the Jewish people." According to the New York Times, he was Shabbos observant on tour and wore Tefillin. He described inheriting his grandfather's Tefillin, gazing at them and trying to make sense of them. "I saw I really could use this material, how exquisite and skillful these prayers were, how they had been designed by minds that you have to incline your heads towards," he said. "These minds who designed these prayers or received the inspiration to design these prayers–these are incredibly subtle and exquisite prayers for lifting the soul." Just before Rosh Hashana, Cohen released a single which he worked on together with Cantor Gideon Zelermyer of the Shaar Hashomayim and his choir. The song quotes directly from the mourner's Kaddish. Cohen passed away on Monday, the 6th of Cheshvan [November 7] and was buried quietly in the Orthodox Jewish tradition near the entrance of the Shaar Hashomayim cemetery on Mont Royal. The media was notified of his passing on Thursday when the Shaar Hashomayim issued a release which noted that, "Leonard’s wish was to be laid to rest in a traditional Jewish rite beside his parents, grandparents and great-grandparents." Rabbi Adam Scheier shared in a post on social media, that the community had taken great pride in Cohen. "Our pride was not simply that a child of the congregation grew up to be successful and famous; rather, it was that Leonard took the Jewish themes and concepts that he learned at The Shaar and gave them new and inspired expression in his poetry and his songs," wrote Rabbi Scheier. "It was at The Shaar that Leonard first encountered the liturgy of Who By Fire, the praise of Hallelujah, and the reverence of Hineni, I’m ready, my Lord." Finally, his first shiur after the election is here. Thank you Moriah, I'd been checking every day.... except today ! 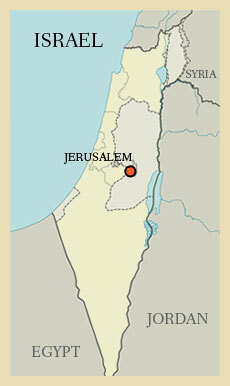 Shlomo Carlebach's ancestors comprised one of the oldest rabbinical dynasties in pre-Holocaust Germany. He was born January 14, 1925 in Berlin, where his father, Rabbi Hartwig Naftali Carlebach (1889-1967), was an Orthodox rabbi. The family fled the Nazis in 1931 and lived in Baden bei Wien, Austria and by 1933 in Switzerland before coming to New York City. Carlebach emigrated to Lithuania in 1938 where he studied at a yeshiva. In 1938 his father became the rabbi of Congregation Kehilath Jacob, a small synagogue on West 79th Street in New York's Upper West Side. Carlebach came to New York in 1939 via Great Britain. He and his twin brother Eli Chaim took over the rabbinate of the synagogue after their father's death in 1967. Carlebach studied at several high-level Orthodox yeshivos, including Yeshiva Torah Vodaas and Yeshiva Rabbi Chaim Berlin in Brooklyn, New York, and Bais Medrash Gevoha in Lakewood, New Jersey. His voice and musical talents were recognized quite early during his days in yeshiva, when he was often chosen to lead the services as a popular Chazan ("cantor") for Jewish holidays. As is engraved on his tombstone, he became a devoted hasid of Rabbi Yosef Yitzchok Schneersohn, the sixth Rebbe of Chabad-Lubavitch. From 1951-1954, he subsequently worked as one of the first emissaries (shluchim) of Rabbi Menachem Mendel Schneerson, the seventh Lubavitcher Rebbe, until he departed to form his successful model for outreach, reaching hundreds of thousands of Jews worldwide. In 1972 he married Elaine Neila Glick, a teacher. They had two daughters, Nedara (Dari) and Neshama. Neshama Carlebach is a songwriter and singer with a substantial following who has written and sung many songs in her father's style. 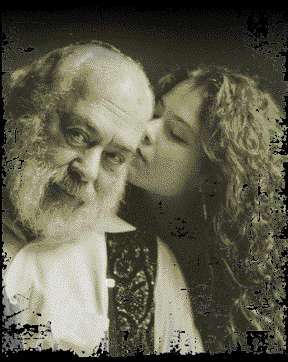 Carlebach died suddenly of a heart attack on 20 October 1994 while traveling on an airplane to relatives in Canada. Seated next to him was the Skverer Rebbe's gabbai; they were singing the Rebbe's favorite melody, Chasdei Hashem ki lo Samnu ["G-d's lovingkindness does not end"]. Carlebach was very close with many famous hasidic rebbes, including the Amshinover Rebbe and Bobover Rebbe. He is regarded as one of the most successful kiruv personalities of the 20th century, reaching many Jewish souls through his music, storytelling, and teaching. If you see someone doing wrong, you have to tell him. You have to tell him. You have no right to remain silent. If someone sees his friend walking in the wrong path, it is a mitzva to talk to him, tell him he is doing wrong, but it has to be done in private. Don't tell someone in public that he did wrong, because if you do, you are transgressing about fifteen laws. The G'mora says it's very easy to keep Shabbos, very easy to put on t'fillin, but Rabbi Akiva says the hardest thing is to tell someone when he is doing wrong. Rabbi Akiva was very holy, and he said, "I don't know if there is anyone in my generation who would know how to rebuke." You have to do it in a way that he listens to. Rabbi Tarphon said there is no one who knows how to receive rebuke either. Both are really hard things to do. Before you tell him what he did wrong you have to tell him, "I am saying it to you because I am really your friend, I am concerned. It is not that I can't stand sin, like a missionary, that I want to abolish sin in the world. I really care for you, and it hurts me that you did wrong." Say to the person, "I don't want to change you. I'm not putting you down on a couch and analyzing you. I care for you, and it seems to me that you did wrong, so can you tell me why?" Then he can tell you, "I know I did wrong. I'm sorry, and I probably won't do it again." Or he can tell you, "I didn't do wrong. You are wrong, because you don't know the whole story." In any case, there has to be communication. What is communication for? Why did G-d give us the power of speech? The Torah is very strong on communication. I have the right to hate someone who did wrong, but if I didn't tell him, I'm transgressing. 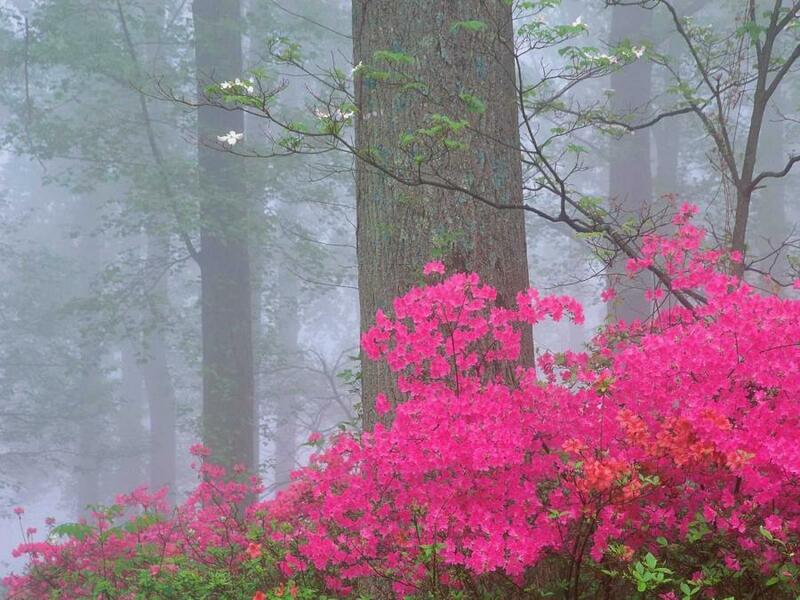 If the person accepts what you tell him, it is good; if not, tell him a few times. If he says, "I don't want to hear you; I don't want you to talk about it to me anymore,"then you don't have to grab him, tie him to a chair; you don't have to be drastic. Talk to him like a human being. The Torah wasn't given to the angels. G-d gave the Torah to human beings. There is such a thing as hating; what can we do? Moishe Rabbenu came up to Sinai, and the angels were complaining to G-d, "Why are You giving the Torah to Moishe? Why aren't You giving it to us?" G-d said to them, "There is no hatred between you, so you don't need the Torah. They need the Torah below, because there is hatred in the world." So the Torah says if you hate someone, you have to talk to him. Imagine, if every anti-Semite took the time to talk to one Jew there would be less killing in the world. If everyone followed this one thing: if you hate somebody, talk with him, make contact with him, it would be a different world. If you want it to work, it will work. The G'mora and Maimonides both say that if I see someone doing wrong and I don't tell him, then I become a partner in the sin. The G'mora says if I see the people of my house are doing wrong, and I don't tell them, I become a partner. If I see the people of my city doing wrong and I'm not raising my voice, I'm becoming a partner in what the city is doing. If the whole world is doing wrong, and I'm not speaking up, then I'm becoming a partner in the sin of the whole world. This is one of my favorite stories. Once I was visiting my cousins in Belgium, and when they invited me for dinner, they said because of me they would eat kosher. So I come to see what is going on there, what they are going to be feeding me. "Because of you it will be really strictly kosher. We know you don't eat ham, so we bought horsemeat." What if I take out a bible, because you have to tell people when they do wrong. "Sit down you dirty sinners. You know horsemeat isn't. . ." Naturally this does not go. It says to rebuke, and that is not the level of rebuking. They don't know anything, so you can't rebuke them. It says you have to tell them in such a way that they know you care for them. If I say, "I am here for Shabbos, and it makes me uncomfortable that you don't keep Shabbos,"that means I don't give a damn about their Shabbos, just about my own. It is a very delicate thing. The truth is, most of the time people know when they do wrong, they just don't have the strength not to do it. When you tell people they are doing wrong in a good way, it gives them strength not to do it again. The Mittler Rebbe says it suddenly becomes like two souls against one evil. If I'm too weak to overcome my evil, the minute someone tells me it is like two fires against one darkness. 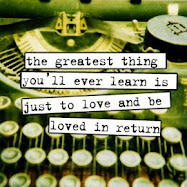 But it is hard to know how to tell people in a good way. 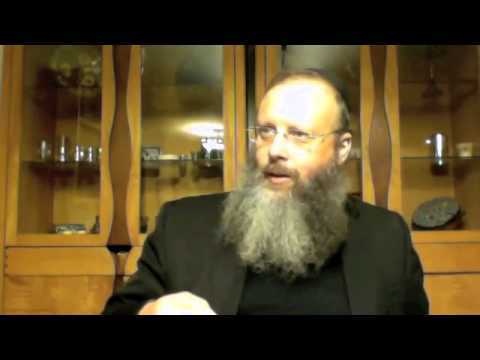 What Will Happen in Israel When Moshiach Comes? Part of a series of Question's and Answers, Rabbi Anava is posed the question of what will happen in Eretz Yisroel upon Moshiach's arrival. In this verse we are not told to whom Hashem appeared. We eventually learn from the narrative that it was Avraham/Abraham. But his name is not used in the verse. The verse begins as a sequel to the previous portion in which Avraham circumcised himself, as is inferred by the first words of the verse, ‘and now,’ making it a continuation of the circumcision story. The Zohar teaches that the circumcision was the reason for this revelation. This was a revelation to the essence of Avraham. It is for this reason that the verse does not mention the name of Avraham, referring to him simply as ‘him’, alluding to his very essence. A name is a description. To one person you may be called father/mother, to another son/daughter, to another boss/employee. Your friends may call you one thing, and your family calls you something else. To each person you are something else. When there is an ‘appearing’ of Hashem to a name, to Avraham for example, it is to an aspect of who he is. At this time, however, there was a revealing to all of him. The very essence of who he is, beyond title and name. Avraham receives such a depth of revelation and intimate connection with the Creator because he is coming from the circumcision. The act of circumcision is to physically and thus also emotionally/mentally/spiritually reveal that which has previously been concealed. When Avraham became fully open with nothing concealed, the Creator also became fully revealed to him, to all of him. Nothing remains hidden. Essence to Essence. Through the Essence of the Creator being revealed to his very essence, he gradually acquires deeper and more spiritually sensitive vision. He can now access the inner reality within everything, the Divine animating force within all of creation, without any concealment. It is a truth about many of us humans, that upon encountering another person we tend to instantly ‘label’ them and feel like we know certain truths about them based on their appearance, dress, upkeep, life 'station', mannerisms, and so forth. The same may be true with all objects, places or events we come in contact with every day. We tend to be easily influenced or impressed with the external realities and overlook the essence of the thing or person. Without consideration of what lies beneath, we define a person, object or event by its external attributes or 'effect' upon us. This week’s Torah reading enables us to see beyond the outer garments. We access a vision that takes us beyond the ‘names’ and ‘labels’ and provides us with deeper and truer visions. We learn to see beyond the concealments and trappings, and view the essence of the matter in its entirety. This is an energy of vision that occurs on many levels. Beginning with seeing each person for their essence, their essential Divinity, and extending to every event that occurs in our lives. The energy this week inspires us to perceive the guiding hand of Hashem in every life event. Essence Vision is to see within every encounter, every situation and person, the Divine animating force. 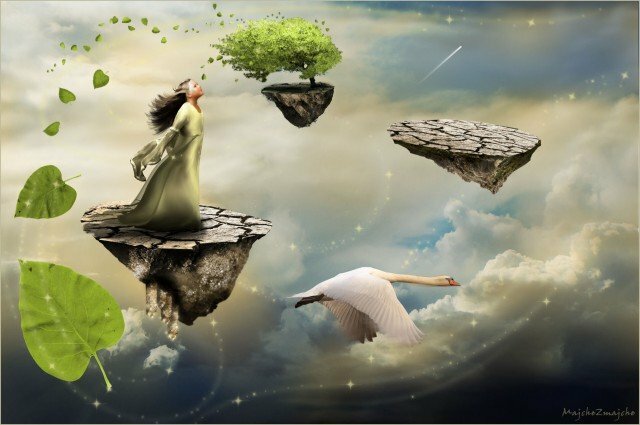 In this way we view everything that occurs as an opportunity and invitation to connect more deeply with Hashem. 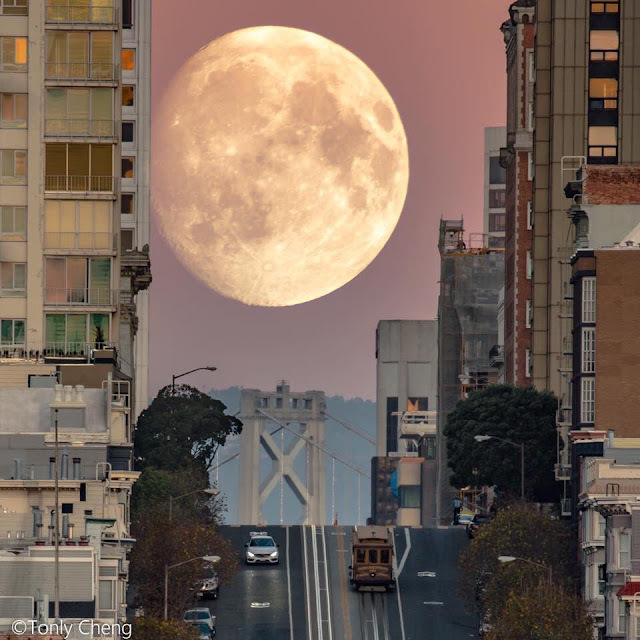 Unfortunately, Sydney's clouds obscured the moon as it rose last night, and although there are photos around, I haven't yet seen one that I love...... but here is a great shot of the Super Moon last night, taken by Tonly Cheng in San Francisco. 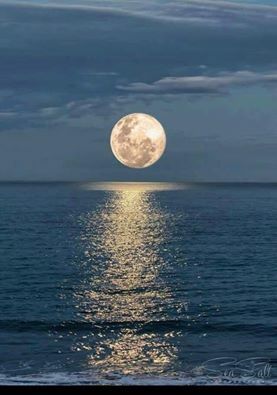 Below: super moon rising in Israel - photographer unknown. Click here for a printable Shir Lamaalot card. 1. End of Sefer Raziel HaMalach, and elsewhere - [The Sefer Raziel HaMalach talks about an angel called Raziel and some attribute that book to Adam]. See Tishbi on the letter lamed, entry for “Lilith.” Plaques featuring the verses of Shir LaMaalot along with the Names [of G‑d and angels] etc. contained therein are well known throughout the Jewish world, each community having its own specific customs. 3. And obviously this will forestall any complications such as “…she had difficulty giving birth” [Vayishlach 35:16]. 5. 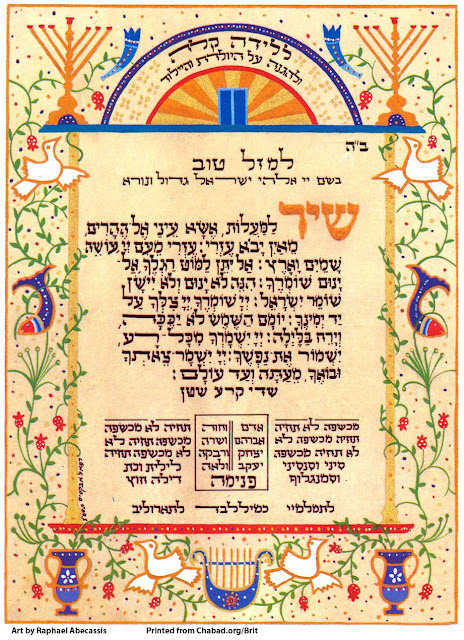 Sichot Kodesh 5737, Sichah 7 of Yom Simchat Torah; also printed in MiGevaot Ashurenu, p. 6, with the addition: “It is true that the child was just born, and cannot yet distinguish between light and dark or between sweet and bitter. Nevertheless, since he has already come into the world and he possesses eyes with which to see the world, we should see to it that before his eyes should be the letters of the aleph-beit, from whose combinations all of creation has come into being.” See details in Likkutei Sichot, Vol. 25, p. 309. Why should the beginnings of Moshiach occur in such an undignified manner? 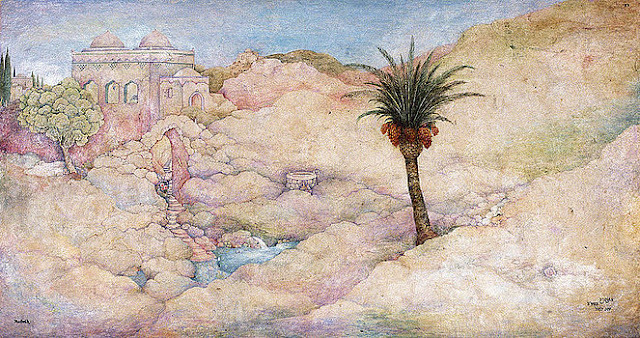 Ramak explains that when a very lofty soul is about to descend into the world, the forces of kelipah [“peel” or “shell”—words used by Kabbalah to describe layers of impurity] oppose the soul's descent vehemently. Sometimes, however, kelipah will consent to the soul's descent if it occurs amidst a particularly sinful act. Thus, we find that from this undesirable act, the ancestor of Moshiach was born. Note: the tsunami warning has now been cancelled, although large waves did threaten after the quake. More at Daily Mail and I will update when more information is known. 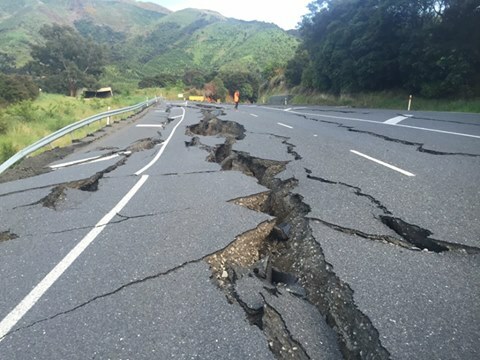 HT Dov Bar Leib [see comments below] - Several hours prior to the earthquake, John Kerry (who had visited the South Pole on Election Day) was in New Zealand to ready them for a late December vote on establishing Paleostine and dividing Jerusalem. And NZ agreed to sponsor the resolution. 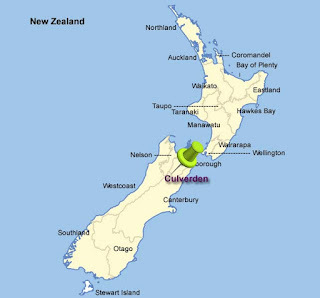 If you take a look at the map, Culverden in New Zealand [the epicentre of the quake] is even in the same position as Jerusalem on the Israel map. This is an extremely interesting lecture from Rabbi Mizrachi. You should know that the negative disastrous prophecies DO NOT have to happen. They are there to scare us into teshuva. I highly recommend listening to this, it is excellent. On 14 May 1948, the day before the expiration of the British Mandate, David Ben-Gurion, the head of the Jewish Agency, declared "the establishment of a Jewish state in Eretz-Israel, to be known as the State of Israel". 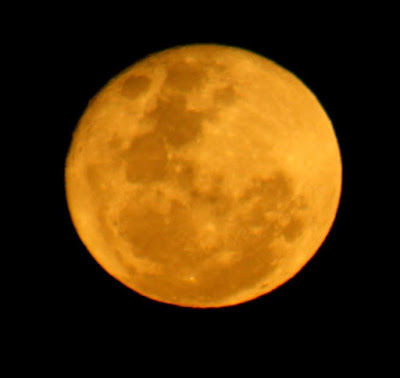 On the night of Sunday November 13, the Moon will be the closest to Earth it's been since January 1948 and will appear up to 14 percent bigger and 30 percent brighter than an average full moon. This is the closest the Moon will get to Earth until 25 November 2034. 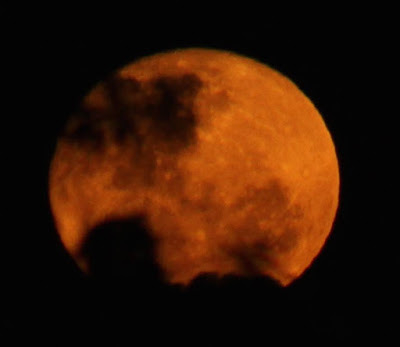 We know that the moon represents the Jewish people. Is this supermoon a sign ..? 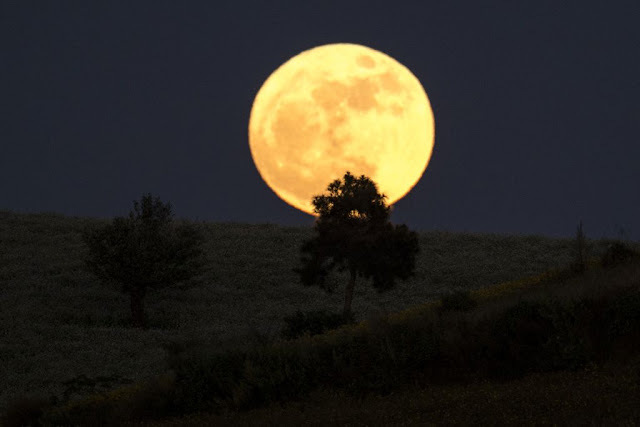 Click here to read more about the supermoon. The Trump Presidency: How did it happen? What does it mean? All the Trump haters need to listen to this lecture from Rabbi Simon Jacobson. Stunning. History in the making. Shocking upset. The greatest upheaval in US Presidential history. A devastating loss. These are some of the ways that the surprising election of Donald J. Trump is being described. No one (except for a select few, who perhaps are as stunned as everyone) expected it -- not in the establishment, not in the government, not in the media. 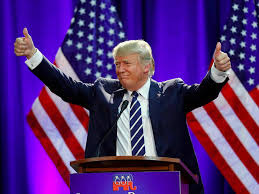 Without even a campaign office in some of the states he won, without a well-oiled political machine, without spending exorbitant sums as the Clinton campaign spent, against all the polls and predictions, despite all his guffaws and offensive remarks -- despite all the odds, Trump pulled off this sound and astounding victory, winning states in which no one ever expected him to be a contender. Every one -- foremost in the media -- is rubbing their eyes. Just look at their faces -- like a doe caught in the headlights. What happened?! No one can wrap their head around this. What did indeed happen? Is Trump a genius? Was the establishment and the media too arrogant? Did the blatant bias of the most powerful voices in America backfire? How could so many experts and strategists have so misread the sentiments of the US public? How did a man vilified by many reputable voices win such a resounding victory? What does nit say about the credibility and reputation of the venerable New York Times, as one example of many media outlets that made it their crusade to defeat Trump (venturing far beyond their mandate of reporting the news without prejudice)? The questions will certainly be asked for years to come. But will anyone ever find the answers? Perhaps this belongs in one of those watershed junctures in history which can never fully be understood. Maybe there is an invisible hand which shows its guiding force at key moments in time? Please join Rabbi Jacobson in this extraordinary presentation about this unprecedented election, as he places it in historical context of events that are shaking up the world today, forces that are disrupting the existing systems and institutions, leading us into a new era. Shock is the natural reaction to changes that jolt us out of comfort zones and conventional wisdoms. Groundswells like these can either overwhelm and upset our very foundations, they can demoralize and disorient us; or they can be seen as convulsions preceding a new birth. If we allow our egos to stand in the way, we will look to blame others and all types of factors (except ourselves) for these shake-ups. However if we stand humble, and set aside our own agendas, we can allow these seismic shifts to open up new horizons. 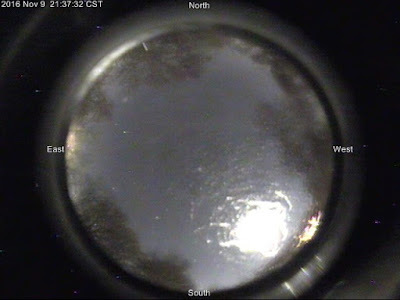 This enormous red object has been seen on the AllSkyCam four nights in a row. Well done Donald Trump! Amazing news - the man with the gematria of ''Moshiach ben David'' - has won the US Election: it must be a sign for us that the times of Moshiach are very near. [and an update: he will be the 45th President of the US.... 45 is the gematria of Geula - thank you Yaak for that info.] I'm sure Ivanka's davening at the Rebbe's Ohel didn't go astray either. 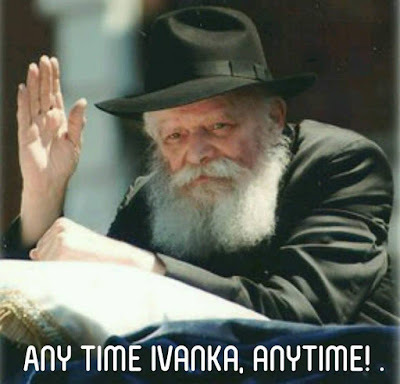 Rabbi Mendel Kessin called it, as you would know if you listened to his ''21st Century'' shiurim, and he also said that Trump would rebuild America. Whether he will get a chance to do so, or Hashem has other plans, remains to be seen. It is an irony that stock markets around the globe took a very sharp down-turn as Trump's victory became kinda obvious. Investors wanted a Clinton win, people are nervous, Hillary was their safer opinion. And the polls got it totally wrong - as we know, blessing comes to that which is hidden, and Trump's popularity was ''hidden'' - seems that people gave the indication they would be voting for Hillary, but when given the privacy of their polling booth, they actually voted Trump. And in the year 5777 Trump will be 70 years, 7 months and 7 days old on his first full day in office. It's going to be a wild ride from here on. P.S. The date is 9 November which here in Australia we write as 9/ 11. Video has now been put up and can be watched below. The Talmud [Shabbat 105a], however, was not satisfied with this interpretation of the name. While the Torah explains “Avraham” to be a syllabic abbreviation of the words av hamon, the Sages converted it into a full-blown acronym. They wrote that each of the six Hebrew letters of av hamon (אב המון) indicates a different aspect of Abraham’s standing and influence in the world. Nun - I have made you faithful (Ne'eman) among the nations. Of particular interest is the example that the Sages chose for a notarikon in the Torah - the name ‘Abraham.’ Why is this significant? The Sages analyzed Abraham’s influence, noting that it incorporated six qualities - corresponding to the six letters of אב המון. Thus, like a notarikon, Abraham’s influence was on two levels. His explicit life-goal was to found the Jewish people. But Abraham had an additional level of influence, as he disseminated his ideals of monotheism and morality among all peoples. By examining each letter of the phrase av hamon, we uncover a different aspect of Abraham’s influence. He was an Av - a spiritual father and mentor to many nations, the source for true knowledge of God throughout the world. His teachings were Bachur - select and distinct from the jumble of confused beliefs and superstitions held by the pagan nations. His faith in one God was pure, free of erroneous influences. Furthermore, his Torah enjoyed a charismatic attraction. 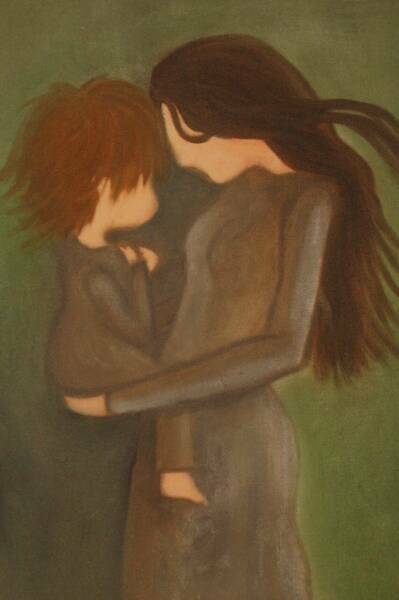 Recognizing its inner truth and beauty, many were drawn to it and inspired by it. It was beloved and Haviv. Due to his sterling character traits and beliefs, Abraham was highly respected. He was regarded as a Melech, a king. The people looked upon him as a “prince of God” [Gen. 23:6]. Like a king in battle, he led the fight for truth in a world shrouded in darkness and ignorance, victorious by virtue of the truth of his vision. Furthermore, Abraham’s Torah was not just some theoretical philosophy. He was Vatik among the nations - respected for his personal integrity and piety. Abraham sought to refine deeds and character traits through the holiness of his beliefs, and promoted a life of morality and justice. The final quality of Abraham’s influence was Ne'eman - as a man of steadfast faith. As the Torah testifies, “He believed in God, and God counted it as righteousness” [Gen. 15:6]. Abraham and his radical ideas kindled a nascent spark of faith among the nations. This flame of faith continues to illuminate the paths of many nations - a flame that will be elevated in the future into a pure and refined faith in God. 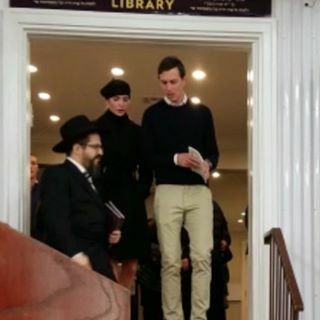 Blink and you'll miss it.... but here is a video of Ivanka and husband Jared Kushner visiting the Ohel of the Lubavitcher Rebbe seeking a blessing days before the election. Rabbi Yosef Mizrachi returns after the holidays. After being buried in a Jewish cemetery in Nazi-occupied Hungary, a family Torah is about to complete a remarkable journey to Sydney. The Central Synagogue, at Bondi Junction, in Sydney’s east, will soon receive its first pre-­Holocaust Torah, the final leg of a journey managed by property ­developer Danny Avidan. The Torah will be flown from Israel to Sydney by his sister, Dorit Avidan Eldar, and her husband, leading Israeli journalist Akiva Eldar. Before it is taken on to the plane it will have been carefully wrapped under the guidance of a rabbi. In 1934 in Budapest, Mr ­Avidan’s grandfather, Haim Yacov Meir Bialazurker, was given a Torah by his 10 children to mark his 60th birthday. But in 1944, amid the chaos of the Nazi invasion of Hungary, someone, without the family’s knowledge, buried the Torah in a Jewish cemetery in the hope it would survive. As the war was ending, a man disguised as a Nazi soldier knocked on the family’s door — he had brought back the Torah, hidden in a potato sack. Today, Yacov’s youngest daughter Susan lives in Sydney and is about to turn 90. To mark her birthday, Mr Avidan — her son — will present the Torah to her at the synagogue on November 7. After the war, the Torah was taken to Israel, but it deteriorated to the point where it was no longer considered Kosher — which meant it could not be read from in a synagogue. With the aim of presenting it to his mother, Mr Avidan had it ­restored, letter by letter, over many months. The Torah, which contains the five Books of Moses, is considered the central document of Judaism. Mr Avidan began the project after reading a book by Susan Gordon, called Finding Eva, about his grandfather and the Torah. “I had to find out more and I had to see that Torah,” Mr Avidan said. “I followed my feelings, went to Israel and found it. He said that for his family, who came to Australia in the 1960s with little family and money, bringing the Torah was “a way of bringing and planting our heritage in our country, Australia”. “Having my mother still with us to be able to embrace that, and feel the satisfaction of knowing that for me, my children and great-grandchildren in years to come will always know the story of where we came from — and the Torah will be our family root, our family tree, and hopefully keep us practising Judaism in the manner that my grandfather did and the manner that we try to do, and hopefully future generations in our family will do,” he said. “In 1944 people were worried about surviving, eating, and my grandfather was very active with the Wallenberg movement and the whole Swedish movement in saving his family’s lives and as many people’s lives as possible by handing out Swedish papers. “I don’t think the Torah was a concern. As the war was ending in Hungary, a person disguised as a Nazi brought him the Torah and, as far as I understood it, my grandfather was overwhelmed that the horror, the dark night of the last couple of years, had come to an end. The Chief Rabbi of the Central Synagogue, Levi Wolff, said even if one letter of a Torah was cracked it was deemed not to be Kosher. Asked how he saw this story at a human level, Rabbi Wolff said: “At first glance, it may seem like a stretch to find common ground between Danny’s Hungarian grandfather, his mother who resided in Israel and his Aussie children,” he said. 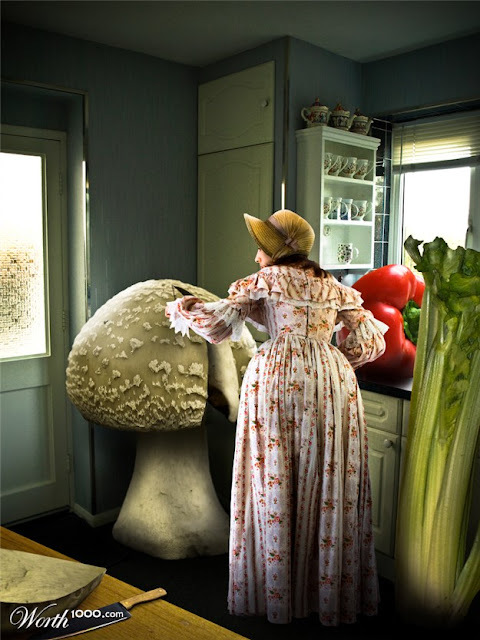 “Different language, different culinary tastes and vastly different recreational activities and sporting teams. 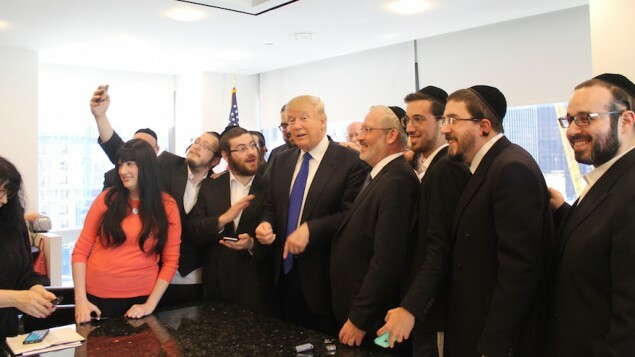 The head of the Republican Party’s branch in Israel, attorney Marc Zell, told an ultra-Orthodox website that an unnamed but “great” Jewish mystic told him Judaism’s major mystical work predicts an election victory for Donald Trump. 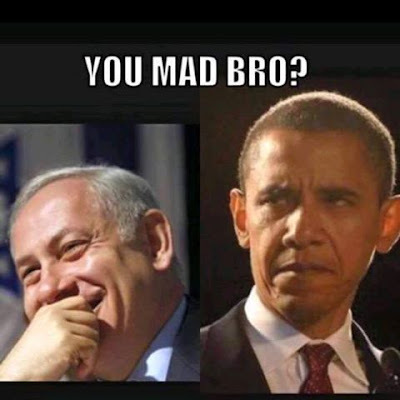 ''....a mekubal, or sage steeped in the Jewish mystical tradition of Kabbalah, had informed him that according to the tradition’s seminal text, the Zohar, Trump will be the next president of the United States. Could G-d's blueprint for creation exclude over 99% of the world's population? In this video from 1986, the Lubavitcher Rebbe is talking about the obligation of the Jew to teach the Seven Laws of Noah to the non-Jews. I have not previously seen this video, I discovered it after searching for an hour, trying to find a different video which I subsequently could not embed. I know there has been discussion on other blogs that Jews are NOT obligated to teach these laws to the nations, but here is the Rebbe on video clearly stating the opposite. None of this in any way endorses any cults or groups attempting to latch on to the Jews by way of attempting to live as a Jew without either a kosher conversion or having a Jewish mother. There is no midway point: just like a pregnancy.... you either are or you aren't.... you are either a Jew, or you are a Gentile, and that's it folks. 4. The prohibition of immorality and promiscuity [Do not engage in adulterous, incestuous, bestial or homosexual relations. Respect the institution of marriage. Marriage is a most Divine act. The marriage of a man and a woman is a reflection of the oneness of G-d and His creation. Disloyalty in marriage is an assault on that oneness.Wholesome families are a basis of healthy communities and societies. Immorality leads to inner decay. [Gen. 2:24].